We all have a past, a past quite often filled with fond memories and memorable experiences. Experiences that can be character building and instill a sense of confidence or strength. 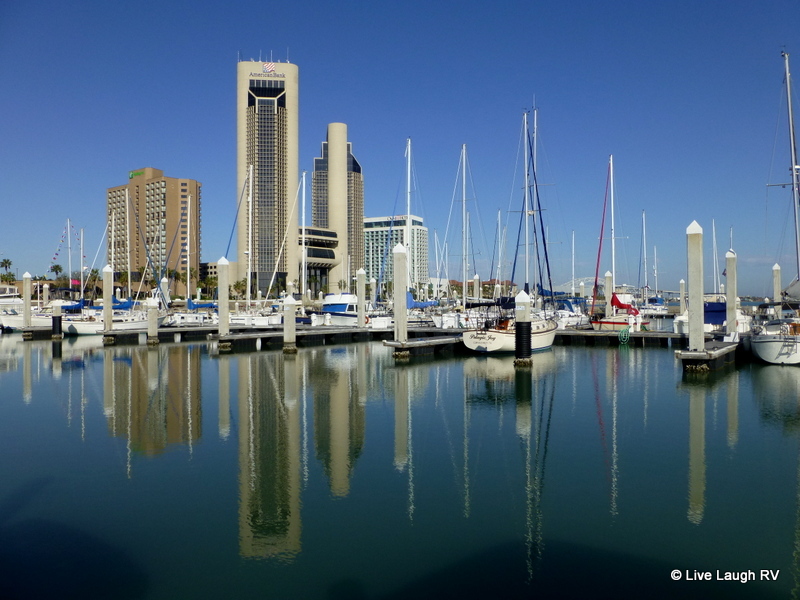 Back in the 1970’s, hubby was pleased to call Corpus Christi, Texas home. This was a very exciting and memorable time for a young man in his early twenties. He was a flight instructor in the Navy. Just two years earlier he was stationed in Pensacola, Florida, learning how to fly. 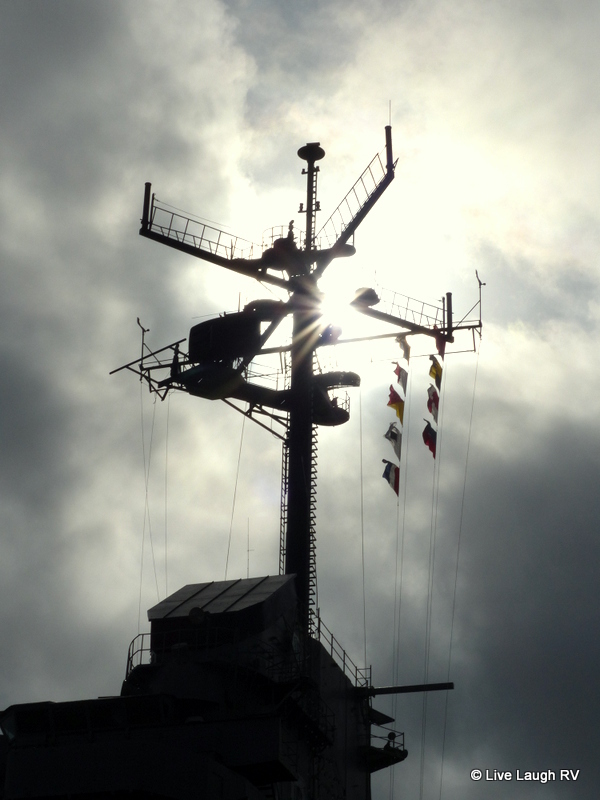 At the time, in order for a Naval Aviator to earn his wings, he was required to fly on and off an aircraft carrier. For Al, that carrier was the USS Lexington. 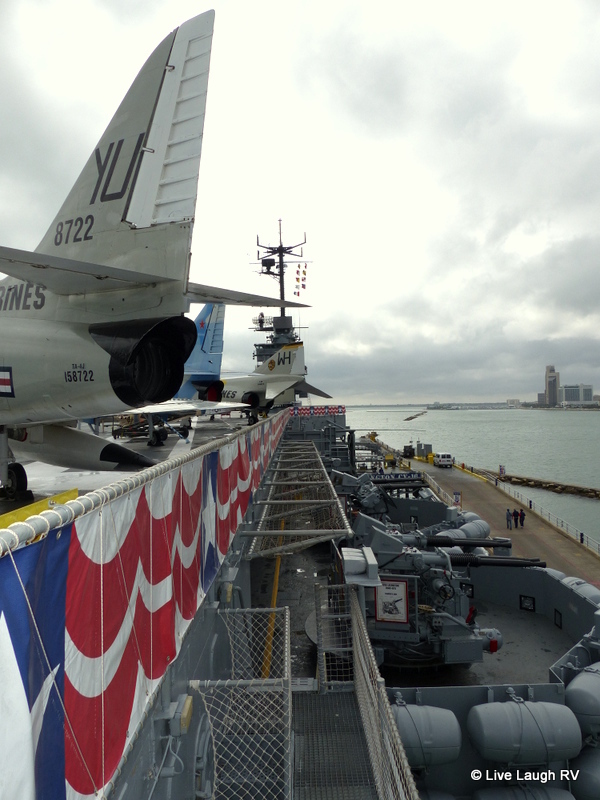 The Lady Lex has since been retired and is comfortably docked in Corpus Christi Bay and has been turned into a museum. Although Al didn’t push to do the museum tour, I knew it would be a special day filled with fond memories. I also knew it would be something he would very much like to share with me. Thus, on a cool overcast day we set out to explore the Lady Lex from top to bottom. 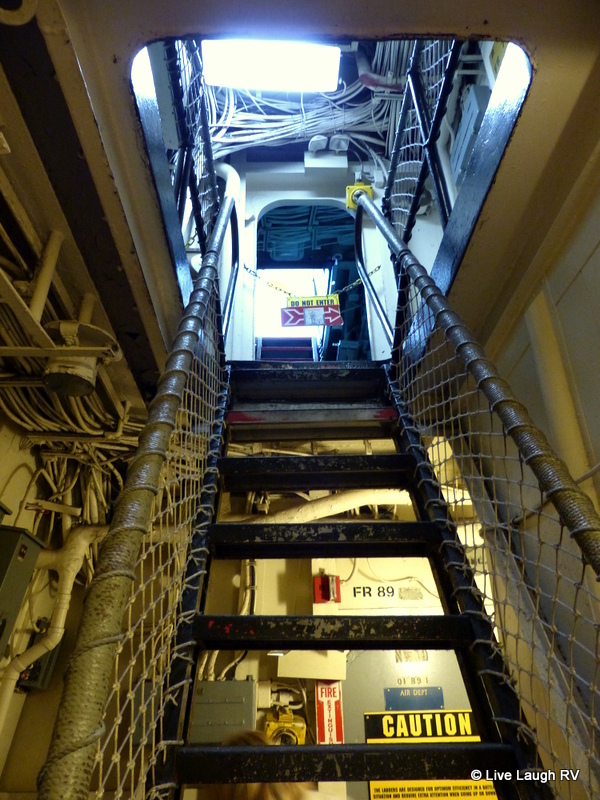 When I first laid on eyes on the USS Lexington, she looked like a huge ship but upon closer examination and assessing the upper deck – landing area I found myself reacting with a, “Holy sh*t! You landed on that? You really were are one crazy son of ……” Al responded to my expletive filled comment in one of his lengthy and creative tales from those first days on the Lady Lex. First the stories of taking off from the aircraft carrier and the sensation and G forces. Then the story of landing on her that first time and his difficulty finding the ship. She was most definitely a little floating area in a massive sea. Think about it, all the while the ship is bobbing up and down, side to side, and he needed to land on this tiny, moving strip. I don’t recall him not smiling the entire day during our visit. He was a wealth of information and the perfect tour guide. He shared his knowledge on the various aircrafts and their uses over the years…… in an abridged version mind you…. perfect for my short attention span. And although I was interested in the various planes, specifically the planes he flew, I was drawn to things like “the plank”. Perhaps I’ve watched one too many Pirate movies. However did you manage to sleep and live in these quarters? 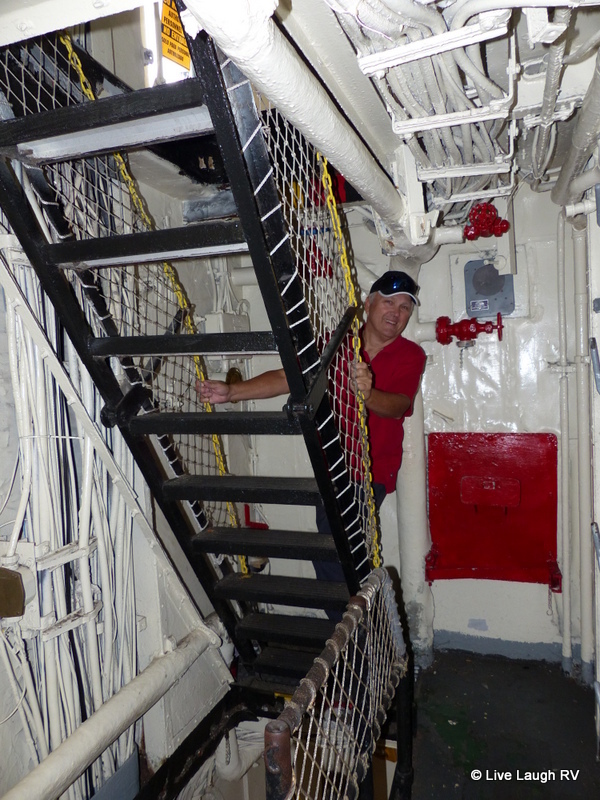 I did have a great time exploring this ship and realized no way in heck could you get me to go out to sea for even a day on the USS Lexington or any other ship. I can feel the bile in my throat just thinking about it. 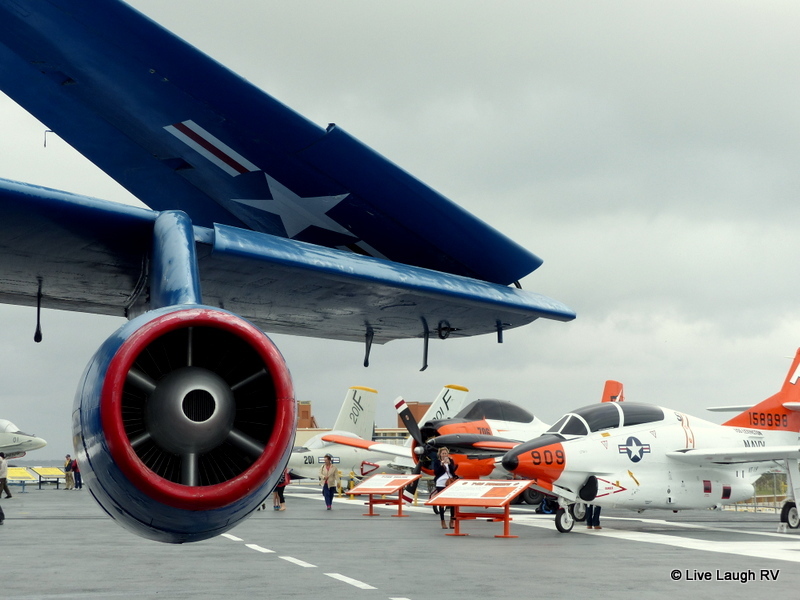 The USS Lexington is rife with history. She was involved in some VERY important, life changing battles, one of which was the freeing of the Filipino people from Japanese occupation in the early 1940’s. Smoking meat and sucking shrimp! What a life that must have been! The thought of those giant birds landing on a moving ship in the ocean boggles my mind. Great tour and fabulous photographs! Thanks. I’ve seen Wal-Mart parking lots with a lot more room to land so it boggles my mind as well. Hubby’s face lights up talking about those days and the adrenaline rush. Nice set of pictures. My respect to your husband! Military people even after retirement understand and enjoy their life differently. Enjoy your life together for as long as possible! Reblogged this on Smokey Camping. WOW and thank you for you tour of a great navy ship, sounds like you had a great time, and I want to Thank your husband for his duty on board and with the Navy. Sure hope to see it in real life some day, would be great to even meet with you and your family, Thanks again. You welcome and thank you for the reblog. I was glad I got to tour the Lady Lex with hubby and share that walk down memory lane. Hope your health allows you to get out and explore allowing us to bump into each other. What a great day out for you both! Thanks for sharing Ingrid. Cold and wet here. Lovely! AND why aren’t we in Phoenix??? That is way too cool. It would really be neat to be Al. I would have loved to have been part of the crew of one of those ships, flying from one would have been,,,, way over the top. Too cool. I’ll bet he does, You are right and lucky, he would be a great tour guide. There were many (as I am sure you are aware) at the Midway that were volunteer guides who were pilots and flew from the Midway. I had to really resist the urge to ask (too many) questions, they had a schedule to keep!!! It was fascinating to be hearing the real stories from those who were there. Ingrid, how wonderful that you were able to share this important chapter of Al’s history — he’s quite the guy!! I’ve always wondered how in the world those Navy pilots manage to land on an aircraft carrier. Takes a lot of skill and courage and it sounds like Al has plenty of both! We’ll have to visit the Lexington next time we’re on the Texas coast. I’m not sure I’d recommend Texas like I would Colorado but for us this area holds a bunch of fond memories. I shared a very special day with my mom here as my folks were winter Texans for a number of years. So it’s been a fun visit on many levels. How sweet and romantic to have the opportunity to hear about Al’s young Navy days in the place that they were created. Sounds like you enjoyed it as much as he did. 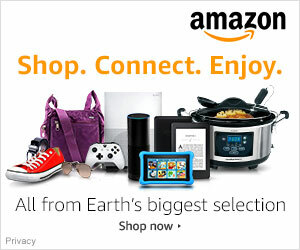 A great post about your day of sharing! And just like you, I’m only there for the tour, I won’t disembark! No cruises for me. WOW…how cool for you both to be on the ship that Al was stationed on. 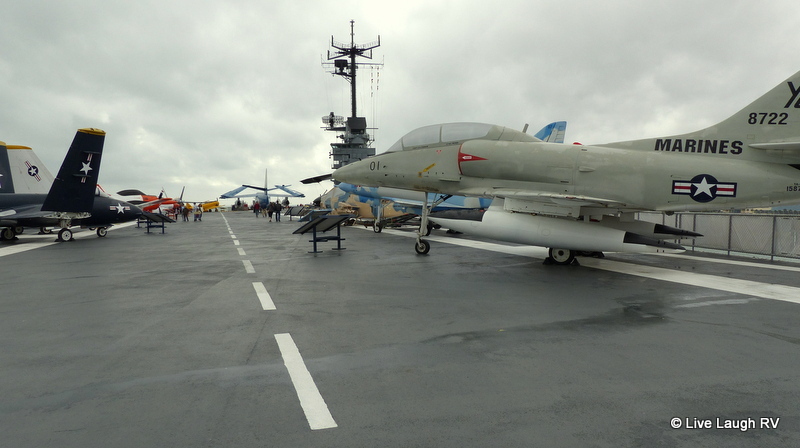 We took the tour of the USS Lexington. and loved it. I am with you Ingrid. I would never be able to survive on a ship! Oh my goodness Ingrid! Flying UNDER the Golden Gate Bridge? My hands are sweaty thinking about it. Wonderful to hear his stories through your post. I can only imagine what a special day it was for him doing the tour. No wonder that grin is so obvious! 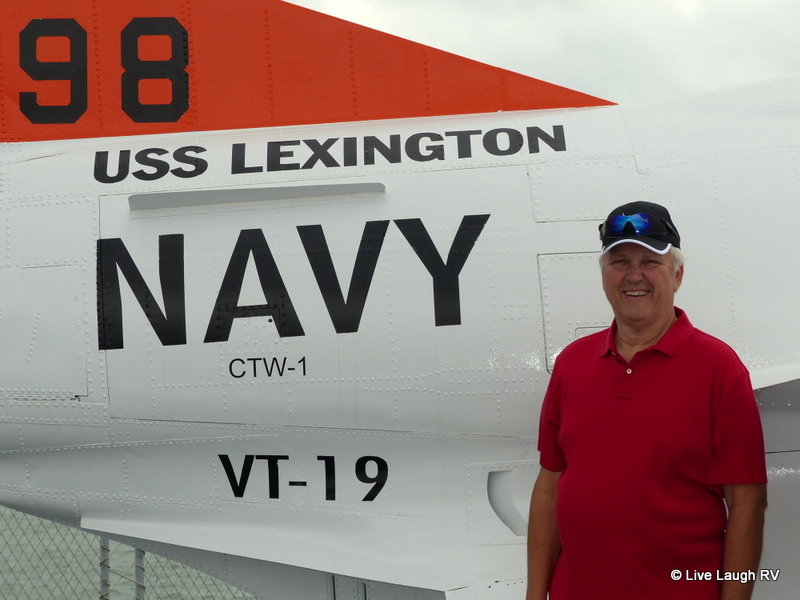 Yes, he has the fondest memories of his Navy flying days and with daring stories of his military adventures, it’s no wonder he found commercial aviation so boring. And I can’t believe you having sweaty hands…. ever! I can only imagine how special it is to be a Naval Aviator and how much more special it was to be able to share it with you. He has some amazing stories and stories that he can’t divulge. His face lights up when he does talk about those days. It was a wonderful day. I think you got some amazing photos of a subject that’s difficult to shoot. What a nice day to share with your husband. You are lucky to have each other. How totally neat was this! I would have loved to be along to hear all of Al’s stories. I bet they were so fascinating. I can’t imagine landing on an aircraft carrier and having one of those giant rubber bands catch me. Thanks for sharing! Do you think you’re son would want to fly off a carrier? Al was into the daring flying and once he entered civilian aviation he was totally bored. It was fun hearing some of the stories from his time on the Lady Lex. Funny you should mention Kevin. He has never had any interest in flying jets. His love has always been commercial airlines. John says it’s like wanting to drive a bus instead of a race car!! We never understood. Wow, I did not know that Lady Lex helped in freeing my ancestors from the Japanese. That must have been a wonderful fond trip down memory lane for Al. We will visit her as well in one of the forecasted rainy day at the Coastal Bend. What a great experience for ya’ll to share together! I don’t know HOW he managed to land on that ship. It really isn’t that big. The cruise ship we took years ago seemed larger. 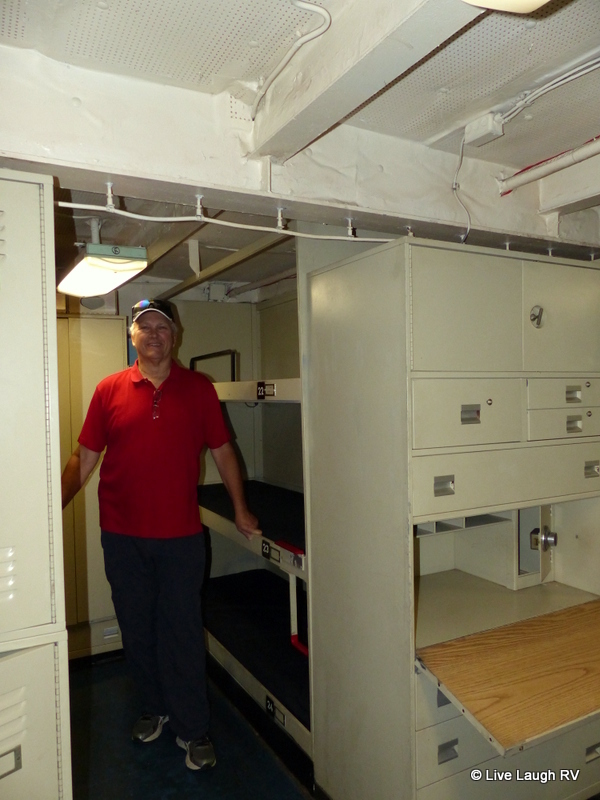 I’m glad we were able to tour THIS particular aircraft carrier – enlightening on so many levels. One of the best posts I’ve read lately. I bet you guys had a lot of fun and way cool Al could re-live some of his past and show it to you. Naval aviators are the best in the business. I spent two weeks at Pensacola going through some of their flight training areas when in Navy JROTC. Wanted to be a pilot and my neighbor was out of the Navy, telling me about his fun times flying Phantoms. Mom, sisters were flight attendants. Unfortunately my eyes went bad so I joined the Army. The Lexington sure has a long history, as I recall she was at some serious stuff out in the Pacific during WWII. 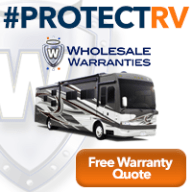 I don’t think I could live in that cramped of a space – being in a 34 foot motorhome is about my limit. 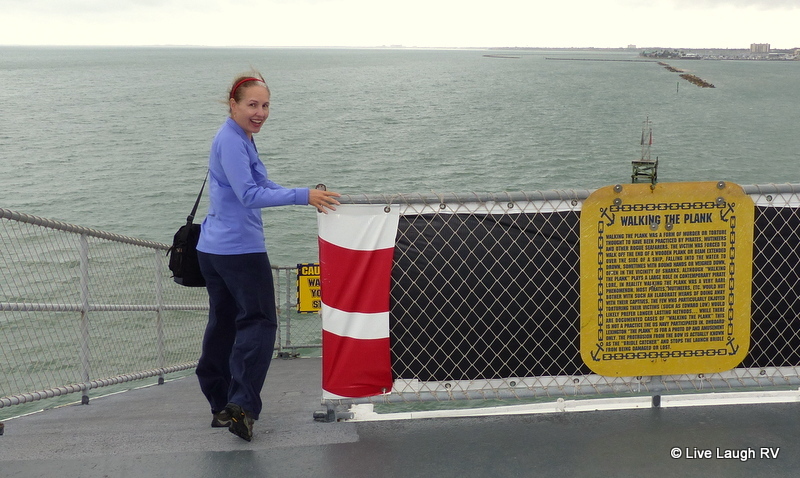 Ingrid – Wow what a special day getting to tour an old ship that Al sailed on years ago. I wish I could tour some of mine, but unfortunately they are all long gone to scrap. I can only imagine the memories that would come flooding back. Would love to swap sea stories around a campfire some day. Thank you for sharing Al’s memories with us, Ingrid! It’s a magnificent ship. 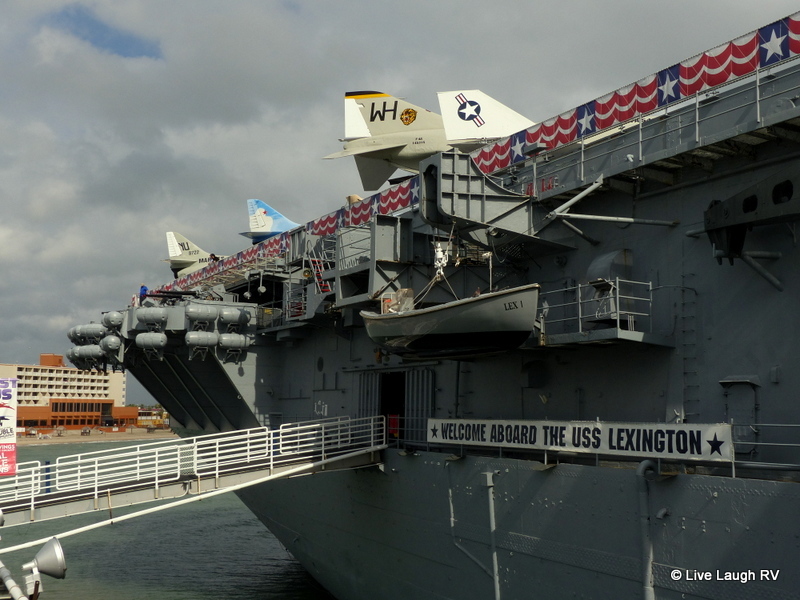 We visited the ship a few years ago, and I read about the history of this majestic USS Lexington they posted. 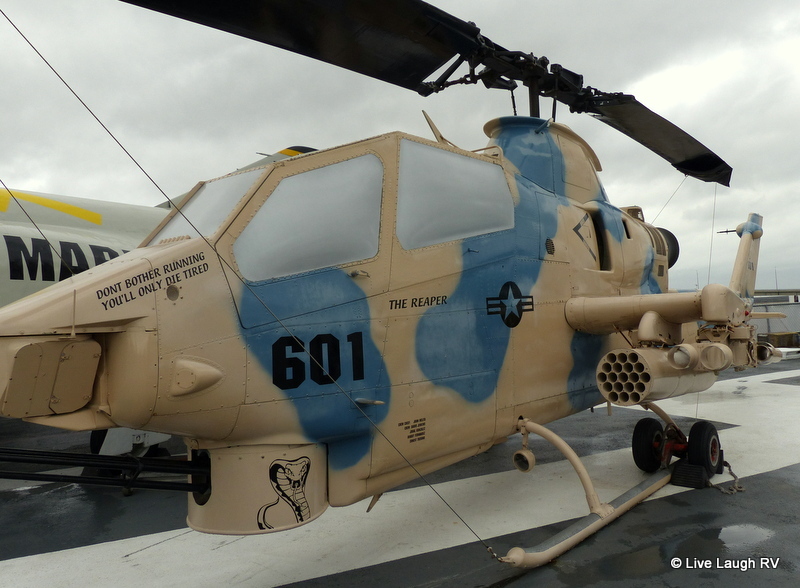 I remember seeing these aircrafts , the cabinets…, and Al was a flight instructor in the Navy, Wow!! !